Hey, folks! Welcome to another article feature for Riku HQ. In Item Stash, I’ll be talking about different items I own and use for my gaming adventures! 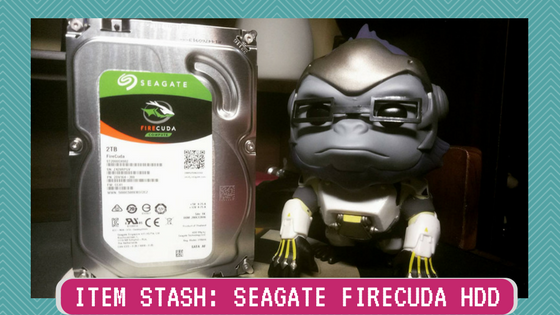 As for our first item, let’s take a look at Seagate’s FireCuda 3.5 inch HDD! Don’t worry. My article is totally newbie friendly for people who just want to see more options for their storage drives when it comes to either building a new rig or replacing your battle-scarred HDDs. The Firecuda 3.5 inch drive HDD basically combines the best of both worlds (HDD + SSD) by having the typical amount of storage space like a standard HDD, either 1 TB or 2 TB but with the power of an SSD to speed up boot times of certain software or games you frequently use. With Seagate’s original technology built inside the chips that run the drive itself, the Multi-Tier Caching Technology™ and Adaptive Memory™ technology, it acquires the ability to automatically detect frequently used data and store it for future use. So once you use certain applications, it loads faster than normal. Meanwhile, it identifies files that wouldn’t benefit from it’s superpowers like screenshots from your last match or a gameplay recording from one of your dungeon raids and just treats it like any normal file. It’s plug-and-play feature makes it hassle-free so we enjoy all the benefits on the get-go without having to configure anything. All prices found below are based on the date of publishing of this article. That’s the current market price at the moment and may subject to change prior notice. Anyway, most standard HDDs will cost just a tiny bit less compared to their SSHD counterparts. So, adding extra hundreds for an SSHD wouldn’t hurt if you have the budget. Most people will recommend the separate SSD and HDD combo but that will roughly cost you around P 8,000 – P 9,000+ for the individual units of the 128 GB SSD and an HDD duo. But if you’re tight on budget and you’re aim is more space for your games and media files with bonus speeds not usually found on standard HDDs, then an HDD like the Firecuda 3.5 inch could be added on your build. For more information on the mentioned product, check out the full feature listing on their website here. Thanks again for reading and shoutouts to Seagate for this awesome upgrade! Feel free to follow my channels on Facebook, Twitter and Twitch for more updates and gaming content!